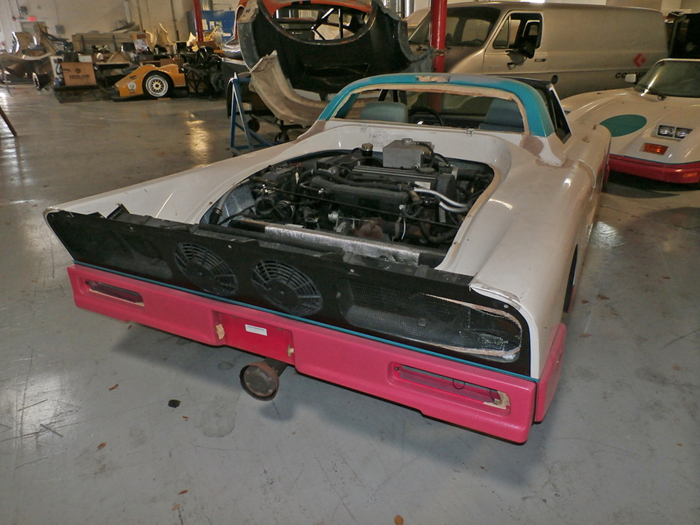 This is about the finding and the restoration of the #19 Targa. I'll try to add restoration tips as they become available. 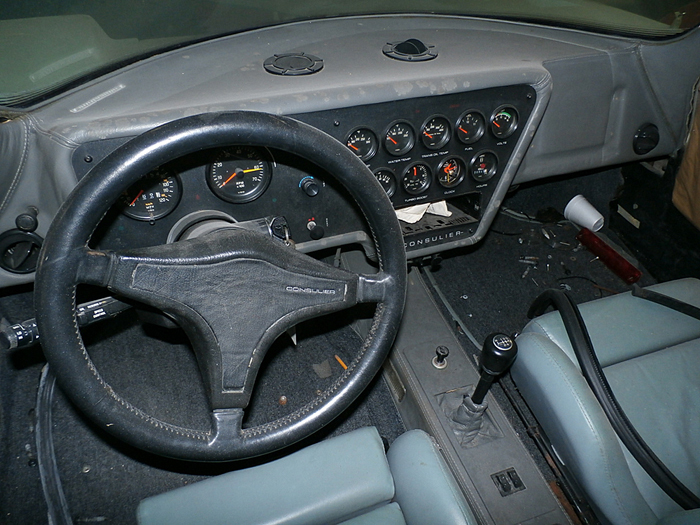 Read the story of how this car was discovered and how it took 20 years to find. Click Here! This is page 1, for page 2, go HERE! About 84 Consulier GTP cars were made. Of these 84, 20 were pure race cars. Less than 10 convertibles were made. This a series 1 street car. About 2300 pounds. Stock it is 175 to 200 hp. It has a 555 Gatreg trans-axle. The engine and trans sit behind the seats. New these sold for $55,000 to $71,000. They were built in Riviera Beach, Florida USA. 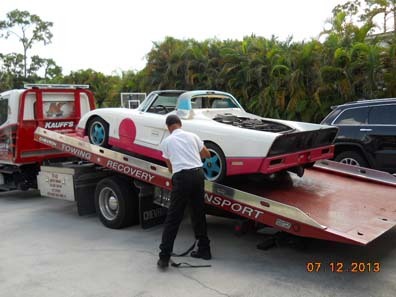 This paticular car was used in a Matco Tool promotion. And was in an early 90's Matco Tool calendar. 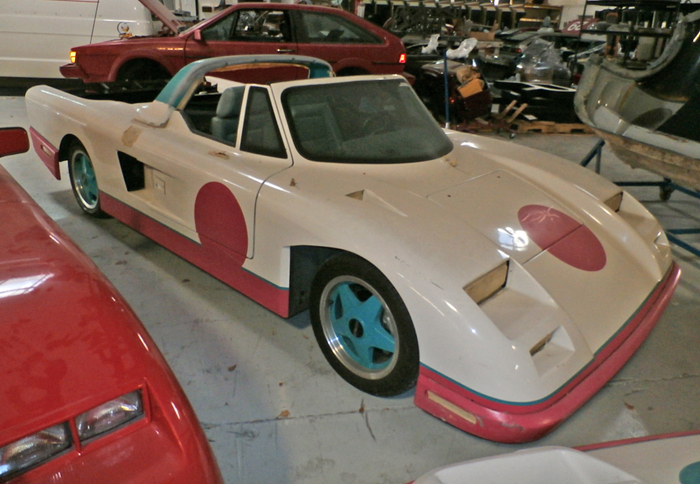 This car was nicknamed "The Barbie" car because of it's colors. 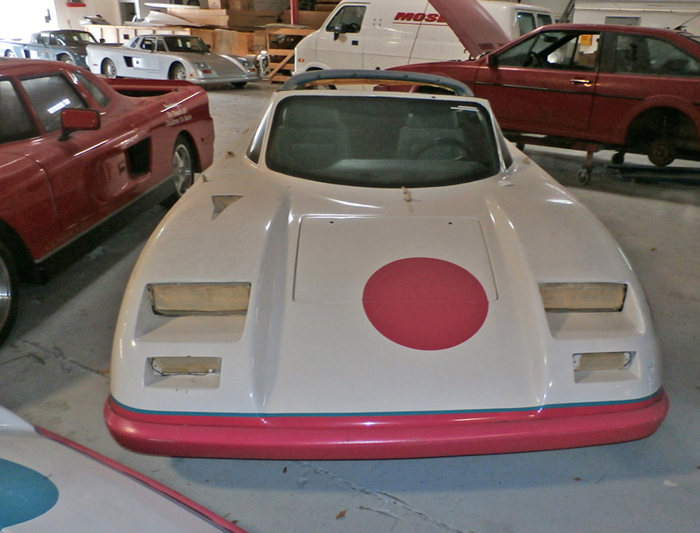 There was also a "Ken" car. If you look at the first photo, you can see it behind the van, and in front of it in this shot. find that it was used at all in the MatcoTool promotion. This car is a LX, which is a step up from the regular GTP. It has Recaro bucket seats, air conditioning, and AM/FM CD radio, tilt steering, cruise control, leather trim package, power windows, power door locks, and 100% wool carpeting. And it had a "car phone" originally, but it was missing when I got the car. 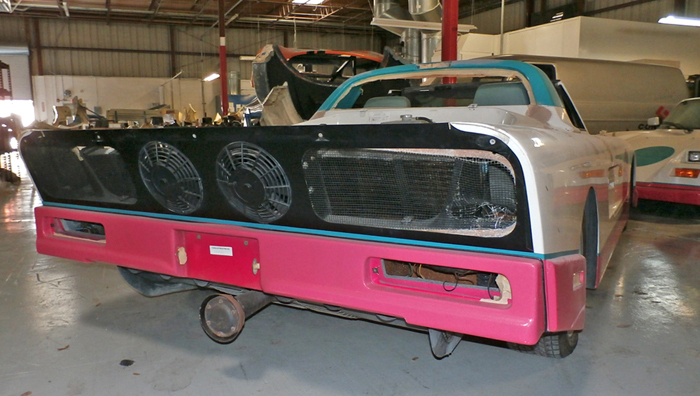 The radiator is in the back tail, those are two cooling fans you see there in the black section. A company called RP High Performance bought out Molser and Rossion Automotive and droppped the Mosler name and will keep the Rossion name. So the new company needed warehouse space and was selling off all the Consulier cars. 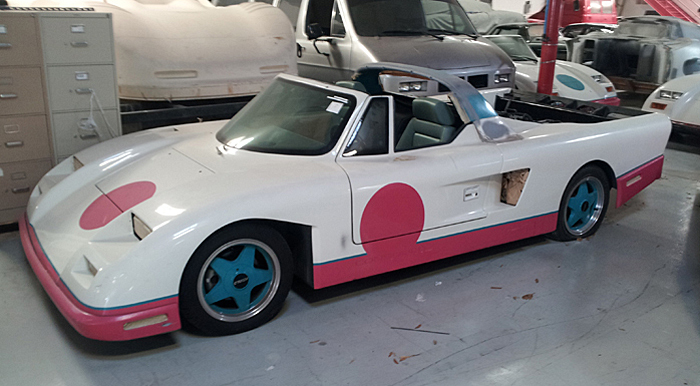 The last one sold was this "Barbie" car. It was being prepared for re-paint, as can be seen by these photos. It was sold as is, not re-painted. It sat with the masking tape on it for 18 years. had a targa cover fitted to it. So there is no top. to this sell, was never sold to the public. I am the first owner, and it is 23 years old. 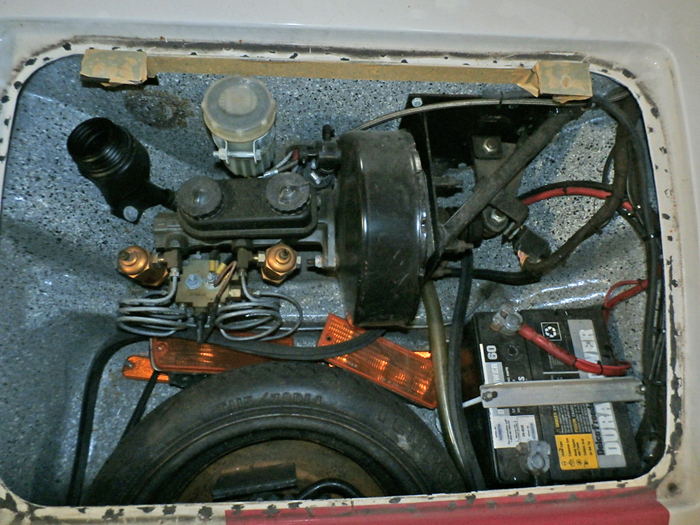 Under the "hood" is this... battery, spare tire, and the brake booster. No room for luggage. All leather seats was an option, which this car has. The pull-out cd radio is missing it seems. As part of the gauges, there is a clock, a hours for the engine gauge, trans temp, among normal gauges. 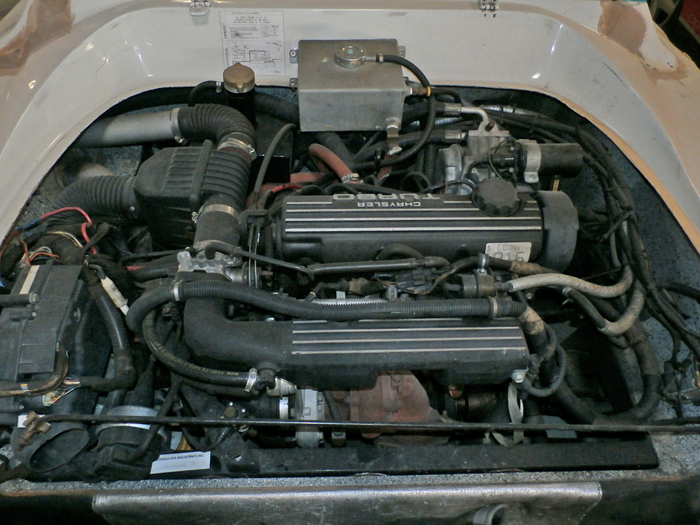 Power is this 2.2 turbo Chrysler 4-cylinder. Only 200HP, but then the car only weighs 2300 pounds. produce 0 to 60 times under 5 seconds. Here is a video link to a few cars that were being sold. come loose and flew off. When it hit the road, a truck ran over it. This car was featured in a Matco Tool promo calendar from 1991.
to have it brought up to running condition. of the work for me to do. 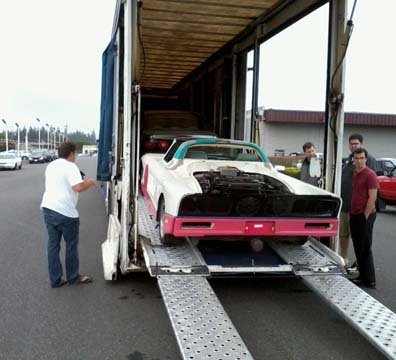 The car was transported from Florida to Vancouver Washington. I then trailered it home. 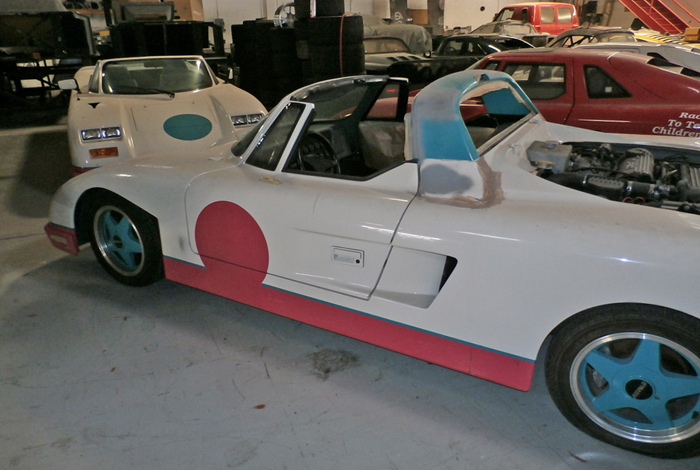 Page 2, CLICK HERE to see photos of it being restored.